South Central Ambulance Service NHS Trust (SCAS) has been named trust of the year. The announcement was made at the 2011 Health Business Awards at the Emirates Stadium in north London on Wednesday. In October it was revealed that it had spent over £10m for private companies to attend call-outs in 2010-11, the highest figure in England. Chief executive officer Will Hancock said: "Response times make a real difference to the survival of critically ill patients, particularly those who have suffered a heart attack, and ensuring that only those who require hospital treatment are taken to A&E keeps this service free for those who really need it. "I am, therefore, proud that SCAS has been awarded Ambulance Trust of the Year for achieving real improvements in response times and non-conveyance rates." Christopher Ringwood from Patient Voice said: "That is really symptomatic of the way the whole NHS is going, but I do think they are doing quite well. "And the patient must come first, so if that justifies the use of private ambulances then fine." SCAS serves Oxfordshire, Buckinghamshire, Berkshire and Hampshire. 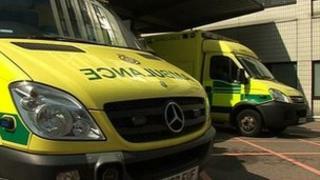 West Midlands Ambulance Service, South Western Ambulance Service and London Ambulance Service were also nominated.